Annan Athletic and Elgin City kicked off their Ladbrokes League 2 fixtures in an entertaining match but it was a game that both teams will look back on and know neither of them did enough to justify winning the game. Elgin had by the better of the first half but Annan having the better of the second half. It was a welcome return back to Galabank for Rabin Omar who was making his league debut for Elgin City having signed from and being developed at Annan Athletic over the last 4 years. The opening 15 minutes were fairly uneventful with neither attack able to seriously make an opening to test either keeper. Approximately mid way through the half Annan created their first attack ending with Tommy Muir cutting the ball back into the path of Aidan Smith but the effort was blocked. Minutes later David Wilson worked his way into a good position ending with a fierce shot which sailed over the cross bar. Brian Cameron worked his way into a good position in the 32nd minute but once again the shot failed to seriously test Alex Mitchell in the Annan goal. Elgin were prodding for the opening as the game entered the final 10 minutes of the half. Rabin Omar came close when he latched on to an inviting cross from the right but the header went narrowly over the cross bar. Annan opened up the second half with far more intent and Chris Johnstone’s penetrating run to the centre of the Elgin defence caused confusion but the shot disappointingly failed to hit the target. Minutes later Johnston made another searching run but this time the winger was fouled on the edge of the box presenting Annan with an opportunity but Aidan Smiths free kick failed to test on loan Dundee keeper Kyle Gourlay with the effort failing to get past the defensive wall. At the other end Shane Sutherland’s header was plucked out of the air by Alex Mitchell. Kyle Gourlay was the called into action when he pushed Aidan Smiths net bound shot round the post in the 56th minute. Shane Sutherland was presented with an opportunity in the 60th minute but his header went straight into the arms of Mitchell. 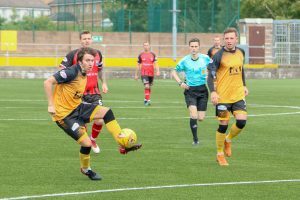 Annan were looking like the most likely team to break the deadlock and the introduction of Ross Fergusson in the 65th minute for Scott Roberts indicated manager Peter Murphy’s intentions to give him more attacking options. Mathew Cooper blasted over the bar in the 67th minute but it was Annan who opened the scoring in the 70th minute. The goal followed a free kick awarded to Annan and Tommy Muir managed to get a touch on the loose ball and Ayrton Sonkur connected with a deft header past the outstretched arm of Kyle Gourlay. Tommy Muir was then denied a second goal by a superb Gourlay save in the 72nd minute. This was a good period of pressure as Annan attempted to put the game out of the reach of Elgin and Aidan Smith went very close with a fine header from a Johnston cross. Elgin pushed Craig Beattie up front in an effort to grab a share of the points and it was Beattie who unlocked the Annan defence in the 86th minute when he took up a position at the back post to head down a ball between Mitchell and Creaney and Brian Cameron made the most of the indecision to prod the ball over the line to earn Elgin a deserved share of the points. Annan Athletic – Alex Mitchell, Scott Hooper, James Creaney, David Wilson, Ayrton Sonkur, Steven Swinglehurst, Scott Roberts ( Ross Ferguson 65min) , Ryan Sinnamon, Aidan Smith, Tommy Muir ( Max Wright 85 min), Chris Johnston. Subs not used Trialist GK, Peter Watson, Jack Brannan, Peter Murphy. Elgin City – Kyle Gourlay, Mathew Cooper, Jordan Lowden, Darryl McHardy, Jon Paul McGovern, Craig Beattie, Rabin Omar ( Moray Taylor 80 min), Brian Cameron, Chris Mcleish, Shane Sutherland ( Ali Sutherland 80 min), David Wilson Subs not used David Banjo ,Stevie Dunn GK, Declan Byrne. Referee – Craig Napier Assistants – David McKniff and Chris Newman.